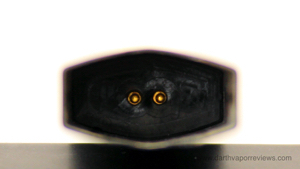 To use the pods, first remove the protective rubber caps from the mouthpiece and the bottom of the tank. 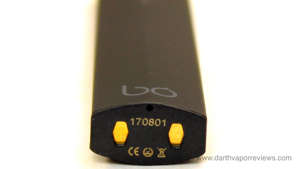 Insert a pod into the top of the BO battery until it clicks. A Blue indicator light will flash when fully connected. That's it. 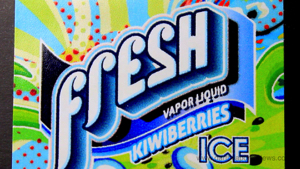 You're ready to vape. * Pods/Caps have to be replaced. 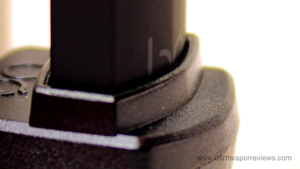 * High quality, sleek look and feel. * Automatic draw feature. No buttons! A review of the BO Vape starter kit pod vaping system. 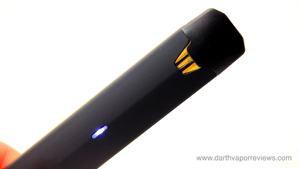 The BO vaping system is a popular, easy to use, lightweight e-cig that comes with pre-filled nicotine salt vape pods. The kit comes in a sturdy, cardboard box. 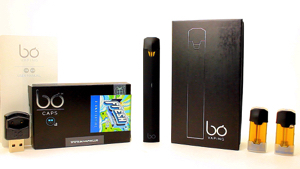 The contents of the kit include: a User Manual, a BO Vape charger, two BO Vape caps/pods and the BO Vape battery. The 380 mAh rechargeable battery has no buttons or screen. It only has a Blue indicator light on the side. Charge the BO Vape battery by placing it inside the magnetic charging dock. 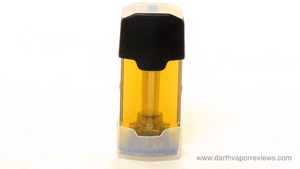 The included BO Vape caps contain 1.5 milliliters of pre-filled nicotine salts in 3.5% nicotine. 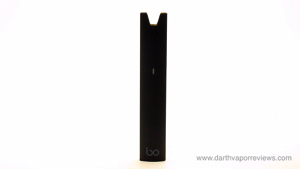 BO Vape pods sold separately in three packs are also available in several flavors. 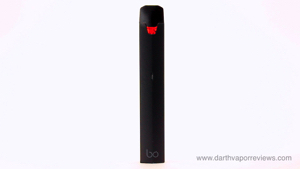 The BO Vaping system is perfect for the smoker looking to quit cigarettes. It's one of the lightest devices that I have used making it closer to the weight of a cigarette. The automatic draw feature is a must. No buttons to mess with. The 35 milligrams of nicotine blended into the smooth hitting nicotine salts provide a great, but not harsh throat hit. If you would like to pick up the BO Vape pod system starter kit for yourself, just click on the links or the logo below. Have an excellent day and may the Vape be with you. The kit currently runs in the $45 range and for a few dollars more, the kit also comes in a pop art version. The higher nicotine content also satisfies those urges quicker which is great for those who don't have a lot of time to vape. Like those short smoke breaks at work. I've tried a few vape pod systems and for it's ease of use and small size, in my opinion, the BO Vape starter kit would be the current go-to-kit to switch to vaping with.